Now step into the way-back machine onto the dance floors of the 1980s. SWEET PEA ATKINSON: (Singing) The sun was spitting fire. The sky was blue as ice. I felt a little tired, so I watched "Miami Vice." HARRY BOWENS: (Singing) I walked the dinosaur. BLOCK: This campy hit by the group Was (Not Was) features the distinctive growl of Detroit singer Sweet Pea Atkinson, dapper on the video with his wide lapels and trademark fedora. It's been 35 years since Atkinson's last solo album. 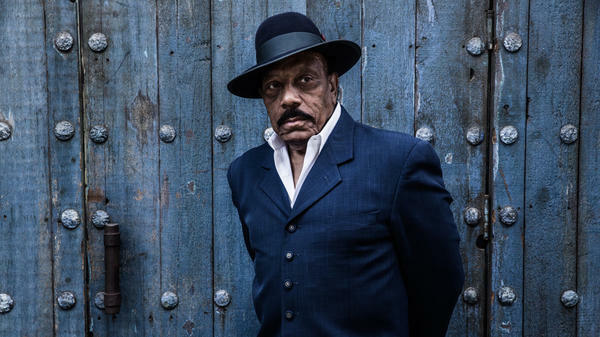 And now at age 72, he is back with an album of cover songs, funk blues and soul. ATKINSON: (Singing) I'm lonely, baby. Yeah, I'm lonely for you. Oh, yeah. Yes, I am. BLOCK: The album was co-produced by Atkinson's former bandmate, Don Was. Sweet Pea Atkinson and Don Was join us now from NPR West. Thanks to you both for being with us. DON WAS: Good to be here. BLOCK: And we're listening to the first song on the album, "Are You Lonely For Me Baby," a hit back in 1967 for Freddie Scott. ATKINSON: I didn't like it at first. WAS: I'll tell you something. We've had a fundamental disagreement for about 35, 40 years, Sweet Pea and I. I've always loved the way he was like a blues shouter, you know, like a Wilson Pickett. But Sweet Pea sees himself as a lover and a crooner. BLOCK: Well, Sweet Pea, where are we hearing your crooning voice, which song? ATKINSON: (Singing) When I was a young boy, they tried to tell me that I was moving, moving way too fast. ATKINSON: (Singing) But I knew everything about everything. BLOCK: Don Was, think back to the first time you heard Sweet Pea Atkinson sing. When was it? WAS: ...Is Sweet Pea wearing like an orange suit. And everything matched from his hat to shoes to socks, all the same shade orange. WAS: And it just looked like there was a fire in the studio. WAS: And he was all charged up because they'd been rehearsing and singing. And he had a million stories. And then I went next door and heard the band play. And it was the voice I always wished I had. And the voice we wanted to write songs for. BLOCK: You do a version on the album of a Temptations' hit from 1965, "Just Another Lonely Night." ATKINSON: Paul Williams, it was. BLOCK: Paul Williams, singer of The Temptations, yeah? ATKINSON: He was my favorite. BLOCK: Let's take a listen to a little bit of "Just Another Lonely Night." ATKINSON: (Singing) Darling, that's the reason why that even in a crowd, laughing out loud, I'm lonely. BLOCK: Sweet Pea, were you always singing? ATKINSON: I had a group called the Exquisite Singing Group. We used to work at Chrysler Corporation. BLOCK: What were you making? ATKINSON: Building rear ends for Chrysler cars. BLOCK: Building rear ends for Chrysler cars - wow. And you'd be singing on the job or after work? ATKINSON: Yeah. We'd rehearse it in the union hall, singing our butts off. ATKINSON: (Singing) You can have Watergate. Just give me some bucks, and I'll be straight. BLOCK: There's a song in here that is really sending us back to another time. It's called "You Can Have Watergate." BLOCK: And this is a song written by James Brown. And I'm guessing this was a whole lot of fun to record in the studio. BLOCK: Tell me about that, Sweet Pea. ATKINSON: I never heard before. And man, the horn section - but I like the song. I should be a single somewhere. BLOCK: Paint a picture of the scene in the studio, Don Was, when you're doing this. WAS: We went into the oldest studio in L.A. It's called Vox Studios - been there since 1939. And there's no gear in there that that's newer than mid '60s. And we really tried to do some of the things that gave those old soul records their character. For example, once we recorded all the basic tracks, we bounced them over to one mono-track because that's what they did in those days. And you pick up a certain character that's on those older records. BLOCK: What kind of character? WAS: I would say - the best analogy I could give you would be looking at high-res video and then looking at a great - a foreign movie from the '60s, black and white with a lot of grain and high contrast. And one's got mood and texture even though it's kind of a distorted picture. The high-res version's got clarity but maybe it's not as evocative. So we were going for, not just an arrangement that complemented Sweet Pea's vocals, but we were trying to get a sonic texture that matched. And I think we did. UNIDENTFIED SINGERS: (Singing) You know, you make me want to shout. Baby, you really knock me out. BLOCK: It's fun to think about how long you guys go back and how long you've been working together. ATKINSON: He's like family to me. WAS: Well, it's the same thing. Everyone can relate if you have old friends that you grew up with. As you get older, you can make other friends. But there's nothing like the people who you've known for 40, 50, 60 years, you know? We've been playing music together for over 40 years. BLOCK: Let me ask you, Sweet Pea. You - we mentioned you haven't had a solo record for 35 years. But who's counting? You've been really busy all these years as a background singer, everybody from from Brian Wilson to Bonnie Raitt. What's it like for you now to be back in the limelight as a solo singer? ATKINSON: It feels great. I'm ready to go to work. ATKINSON: I'm old as dirt, but I can still sing. WAS: (Laughter) He's as old as dirt (laughter). ATKINSON: I'm as old as dirt, but I can still sing. BLOCK: No question about that - well, Sweet Pea Atkinson and producer Don Was, thanks so much for talking to us. The new album is called "Get What You Deserve." Thanks again. WAS: Thank you so much. WAS: Thanks for having us. SWEET PEA ATKINSON AND UNIDENTIFIED SINGER: (Singing) You're gonna get, get what you deserve. You're gonna get, get what you deserve. Transcript provided by NPR, Copyright NPR.